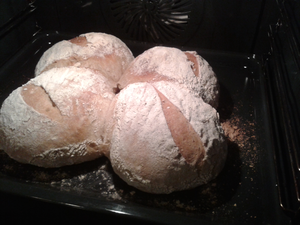 Brunoja's Blog | A record of regular baking (mostly bread). Combine the dry ingredients for the dough and the butter. Add the egg (+- 1/2 an egg) with water and yeast. Knead into a soft dough leave to rest while preparing the filling. Split vanilla pod and scrape out the seeds, put in the milk and bring to boil. Once milk is boiling, take of the heat and leave to infuse. Butter the tin (22 cm round cake tin with loose base). 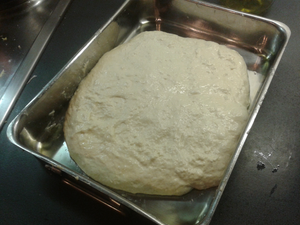 Roll out the dough to 2-3 mm. 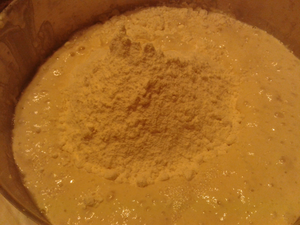 Transfer the dough to the tin and leave to rest while making custard mixture. Put eggs into a bowl keep the white of one egg apart. Whisk the single white to a foam. Start heating the oven to 180° C.
Mix remaining eggs with the corn flower. Add the sugar to the milk and bring back to a boil . 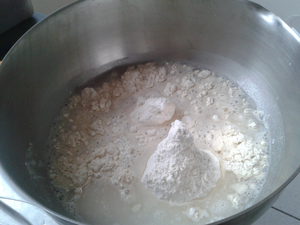 When milk is boiling Slowly add 1/3 of the milk to the egg mixture and mix (use a sieve). When first part mixed continue to add slowly the remaining milk. Fold the egg white into the custard mixture. Fill the tart with the mixture, put in oven for +- 30 minutes. Tip: put tin in oven before filling. Test if the mixture has set. Leave the custard to cool. 2. To finish whip some cream with Teh icing sugar and spread on top. 2. Make a praline : heat the hazelnuts (toasted and without peel) and sugar on medium heat stirring till the sugar turns brown. Turn out (do not touch) on some baking paper and leave to cool. When cool put in the bowl of a food processor and process till a coarse powder. Alternative recipe here. Spread the praline on top of the whipped cream. Serve completely cold (store in refrigerator). Custard slice as in here, but based on another recipe. Classic treat known under various names and variations. 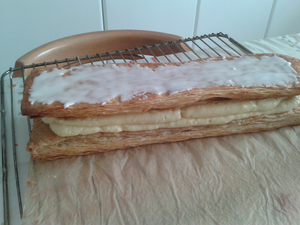 TomPouce or (tom poes) to the dutch, usually with pink or orange icing. 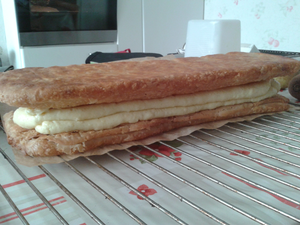 Millefeuille in french classic way. Often with three layers and fruit added to the filling. 1. Make the dough for the puff pastry. Combine flour, salt,with the first 40 g of butter. Add the cold water and mix to a dough. Do not knead the dough too much, result can still be a bit patchy. Leave to rest for at least 15 minutes up to an hour. 2. Flatten the remaining butter between two pieces of baking paper to a square about 20 by 20. Roll out the dough to a square a bit larger than the butter. Place the piece of butter on the dough (sides at 45 degrees) fold in the butter and roll out to a rectangle.Fold the rectangle in 3 (like a letter). Seal the edges and leave to rest in fridge for 30 minutes. 3. Roll out the dough again to a rectangle and fold again in three. Leave to rest. 4. Roll out the dough again to a rectangle and fold again in three. This gives 3 turns in total and 27 layers. Leave to rest. 5. Roll out in a rectangle about 22 by 40 cm. 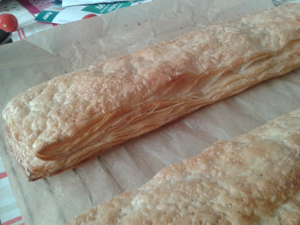 Cut (without tearing) the dough lengthwise into 2 pieces of 11 by 40. Put on a piece of baking paper and leave for half an hour while oven preheats to 200 C.
1. Split the vanilla pod down the middle. Scrape out the seeds, put them in the milk, pod and sugar and bring just to the boil. Take of the heat and leave to for some minutes. 2. Whisk the 4 egg yolks with the corn flour to a smooth paste. 3. 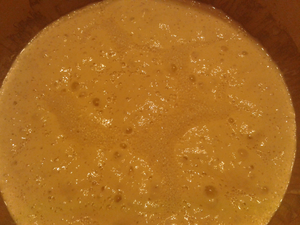 Add some of the hot milk (through a sieve) to the egg mixture while whisking. Add the remaining milk continue to whisk until well combined. Return to the pan, bring to a boiling point where the mixture should be fairly thick. 4. Put on a plate (flat bowl), put some cling film on top of the crème and leave to cool. 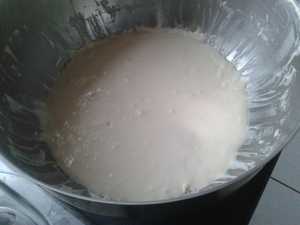 Mix the icing sugar with the water and heat a little till just warm to the touch. Put the icing sugar on top of the pastry. Turns out that 60g was not enough to cover. You can add some chocolate lines and feathers to have a perfect classic look. 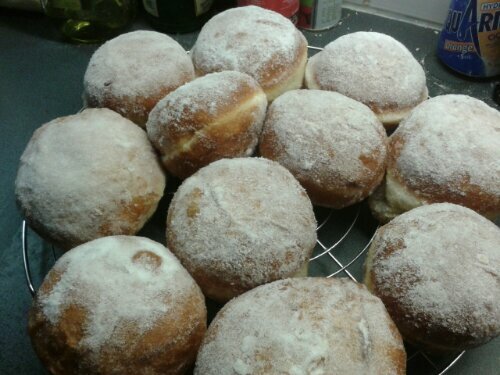 Jam doughnuts as in The Great British Bake Off. Recipe as found here. 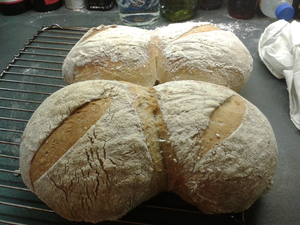 Used exact same quantities, very soft dough and full 10 minutes kneading needed. 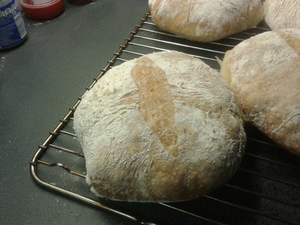 Moderate rise before baking but very good rise once once baking (or frying). Used very fine caster sugar. Instead of inserting Jam into doughnut, cut them in half and spread jam or astry cream on btoh hmaves. Enough for 10 large doughnuts, could easily be 12. Rustic bread from “Bread” by Jeffrey Hamelman. Slightly different from the previous Pain Rustique, a combination of rye, wheat and whole wheat flour used here, some shaping done in the end. Similar: a pre-ferment of about 50% of the total recipe is used. 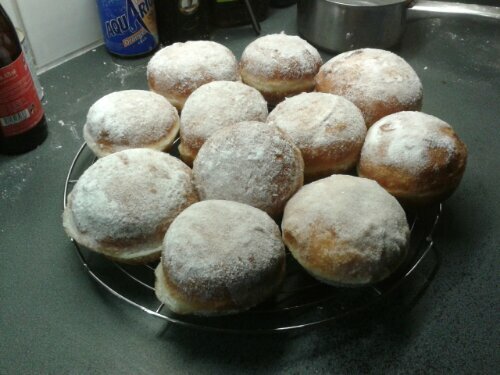 Made 10% of the original recipe (based on 10kg flour). 2. pre-ferment should be well risen by now. 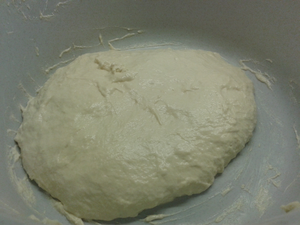 Mix 2nd part of flour with water yeast and salt to a dough. When combined start adding the pre-ferment in pieces, one at a time. Mix for 2-3 minutes. Leave to rise for 2-3 hours. 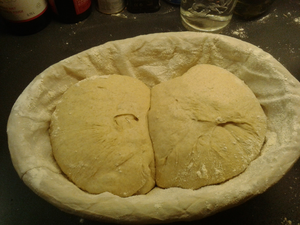 During the rest period fold the dough twice. Used some oil on the working surface to avoid sticking. 3. 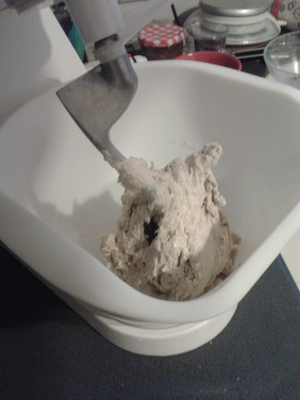 After the rise turn out the dough on a well floured surface. Divide in 2 – 4 equal pieces, shape into rounds. Leave to rest for 10 to 2à minutes. 4. 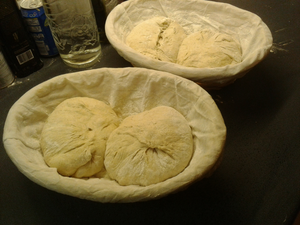 Shape each piece into a round and put into basket or on floured baker’s linen. Had to put 2 pieces into one basket. Leave to rise for at least an hour. 5. 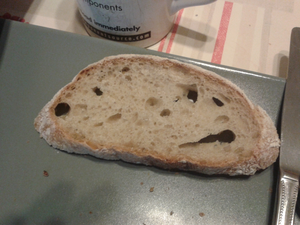 Preheat oven to 220 C.
Invert the dough on a warm baking sheet and bake for about 40 minutes in oven at 220 C.
Pain rustique from Bread by Jeffrey Hamelman. 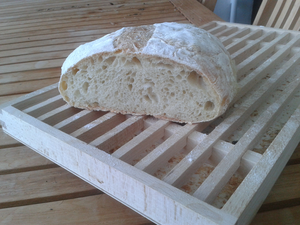 Bread made with 50% poolish, no kneading and little to no shaping. Recipes in the book state US and Metric quantities for big batches (30+ loaves) and home batch. The ingredient list used is 10% of the metric values for big batch. 1. 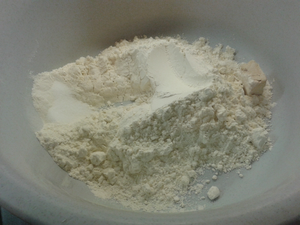 Mix flour (500g),water (500g) and yeast in a bowl. cover bowl and leave to rise for 12-16 hours. Continued after 10:30 hours. 2. 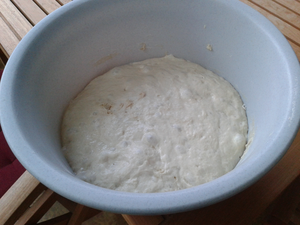 Poolish well risen now. mix again and leave to rest for another 30 minutes. 3. Add the salt and yeast and mix in a stand mixer for 2 minutes. leave to rise for about 70 minutes. 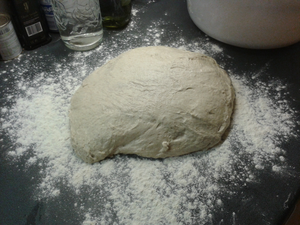 During this rise fold the dough twice (after +- 25 and 50 minutes). As the dough was quite sticky turned out the dough on an oiled surface. 4. 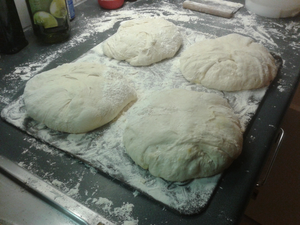 Turn out the dough on a floured surface and divide in 3 or 4 equal sized breads. 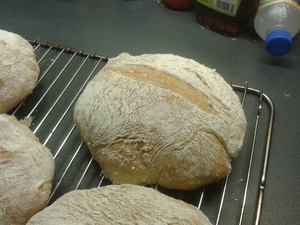 Put breads with floured side down on a floured tray. Folded the dough a bit to give some extra strength. 5. 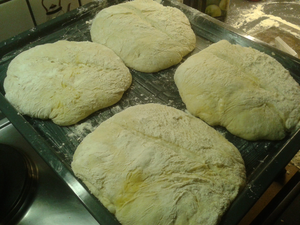 Turn over the breads on a peel, slash and bake in a hot steamed oven at 235 C for about 35 minutes. 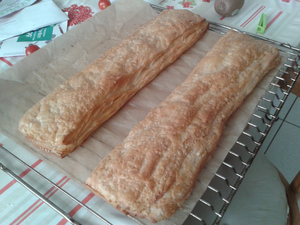 Had to put them on a greased tray and baked them at 220 C for about 40 minutes without steam. 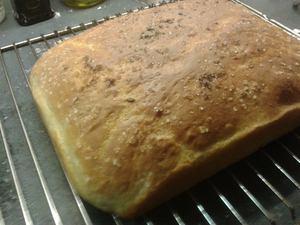 Focaccia based on recipe from ‘Brilliant Bread’ by James Morton. Recipe in book is somewhat different from video. The one below follows the book. 1. 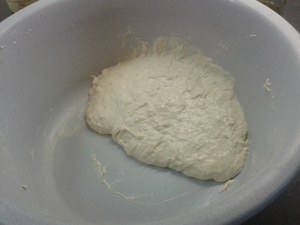 Put flour, salt and yeast in bowl. 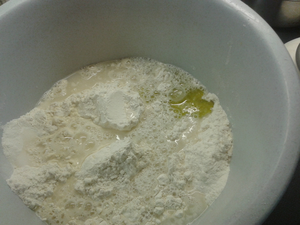 Cumble the yeast with some of the flour, add water and olive oil. 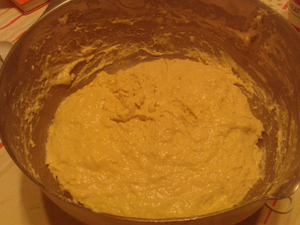 Mix to a very wet dough, more a cake-batter. Leave to rest for 30-40 minutes. 2. 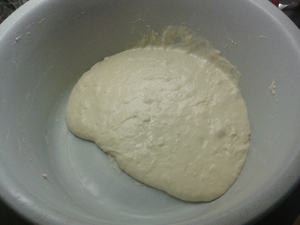 After 30 minutes dough slightly risen. With greased hands lift up the dough and fold it over. Turn the bowl and repeat the folding. 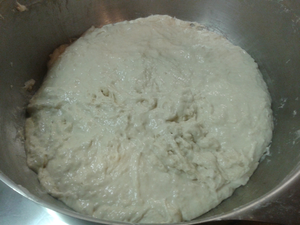 Continue till dough starts to hold its shape. Leave to rise for another 1-2 hours (or leave overnight in fridge). Oil a baking tin. Turn out the dough in the tin. Fold the dough in half, repeat. 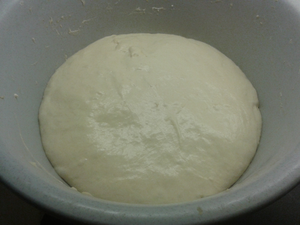 Flatten the dough and stretch out into the corners. 4. 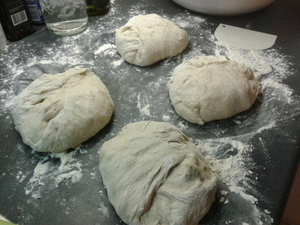 Press fingertips in the dough to make indentations, Drizzle with olive oil and coarse salt. Left out th eindentations and the extra oil here. Bake in a preheated oven at 220 C for about 20-30 minutes.